IMAT is based on a medical model. We know chronic opiate use changes the brain, yet it’s possible to recover fully with the right treatment and counseling. The key to optimal recovery is a personalized experience with treatment options that keep patients at the center of their whole-person care. *Our treatment program does not include dispensing or prescribing Methadone. New Patient Registration. First we ask people to enroll as a patient with One Community Health. This will provide them access to IMAT services plus our holistic, comprehensive approach to medical, behavioral and dental care. Forms are available here on our website or at our front desk. 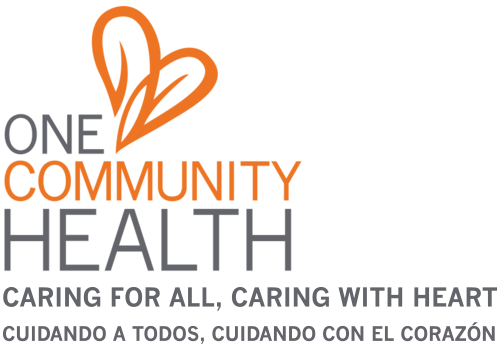 Establish Care With a One Community Health Medical Provider (40 minutes). During this time, the provider will briefly review the patient’s medical history, current medical concerns, and treatment needs. Assessment (90 minutes). Patients meet with a substance use counselor to examine multiple factors (e.g., biological, psychological, social, spiritual and cultural) related to a potential substance use disorder. We’ll work together to determine the best possible level of services for the patient’s individual needs as well as eligibility for the IMAT program. Consultation (40 minutes). If eligible for IMAT, the patient will schedule a follow-up visit with an IMAT provider. In this appointment, the provider will discuss different medication options and the program’s expectations. Induction (several same-day appointments). Each person requires a unique dose of buprenorphine, determined through a series of short provider appointments During these visits, they receive small doses of buprenorphine until physical withdrawal symptoms disappear. Stabilization. Once the medication dose is established, patients stay at that dose until steady blood levels are achieved. Counseling (weekly / bi-weekly / monthly). Patients participate in individual and group counseling, either at One Community Health or another local counseling provider. Counseling frequency depends on the patient’s unique needs, which may change throughout recovery. Maintenance (routine 20-minute appointments). Our provider may taper the initial induction dose to a lower maintenance dose after a period of sustained remission from drugs of abuse. Treatment engagement, lifestyle changes, and progress will be monitored regularly. Along with their treatment team, the patient has an active role in the recovery process. This phase can last from months to years, depending on the patient’s individual needs. Cessation (routine 20-minute appointments). As treatment progresses, patients and their treatment team may eventually decide IMAT is no longer needed. In this phase, our provider will gradually taper the dose, closely monitoring for signs of relapse. Ongoing counseling provides connection and support. Q: What is opiate use disorder? A: A pattern of opiate use can lead to daily problems with friends, family and others in their community. Typically, opiate use disorder develops when opioids are taken in larger amounts over time, there is an unsuccessful desire to cut down, there’s continued use despite negative consequences, and/or a lot of time is spent on getting opioids, using opioids, or recovering from their effects. A: An evidenced-based, outcomes-focused process of change whereby individuals improve their health and wellness, live a self-directed life, and strive to reach their full potential. Our IMAT staff works closely with patients and their families on a path to recovery that is person-centered, strengths-based and trauma-informed. It is inclusive of family and is individualized and comprehensive. Q: Does IMAT replace one addiction with another? A: IMAT uses longer-acting, safer medications to help overcome more dangerous opioids. Studies show maintenance treatment with long-acting opioids like buprenorphine tends to keep patients healthier, reduces criminal activity, and helps prevent drug-related diseases like HIV/AIDs and hepatitis. Patients who strongly object to using maintenance opioids may choose a different type of IMAT. For example, naltrexone is not an opioid—it works by blocking the effects of opioids in the brain for up to one month. Q: Will IMAT “cure” addiction? A: Opiate use disorder or addiction is not “cured” by medication alone—it is a “chronic” (long-lasting) disease. Just like diabetes is not “cured” by the use of insulin, people with addiction are not “cured” by medications alone. Success in recovery also requires participation in behavioral health treatments such as group and individual counseling, social support, long-term aftercare, and lifestyle changes. Q: Is abstinence from opioids better than IMAT? A: Some people eventually quit using opioids on their own through abstinence, but most face dangerous cycles of relapse and recovery. IMAT can make the recovery process much safer. It has saved many lives by preventing death from overdose. Medical professionals view opioid use disorder as a medical disease. This disease can be caused by repeated exposure to a drug, coupled with genetic or environmental risk factors, leading to physical changes in the brain’s opioid receptors. In this view, addiction can be treated and managed with medication, much like other medical conditions. IMAT Helps People Worldwide Overcome Opiate Use Disorder. At One Community Health, our team-based treatment approach improves whole-person health and wellness—not just addiction recovery. IMAT is best for patients who value the power of a committed, knowledgeable team supporting them in their recovery. It’s ideal for those who want to learn how to thrive through a healthier, more resilient life. If you are interested in discovering how IMAT can help you, contact us today to make an appointment. The Drug Abuse Treatment Act of 2000 (DATA 2000) and the Comprehensive Addiction and Recovery Act (CARA) allow qualifying physicians (MDs), nurse practitioners (NPs) and physician assistants (PAs) to obtain a waiver to treat opioid use disorders with Schedule III, IV, and V medications in the outpatient family practice medical setting, with the provision that patients are required to engage in psychosocial counseling or recovery services. One Community Health's Integrated Medication Assisted Treatment (IMAT) program provides in-house substance use counseling services as key part of high-value medical services being provided by IMAT teams. The One Community Health IMAT program is evidence-based and offers an interdisciplinary and collaborative approach that combines biomedical and behavioral health practices in a seamless system that keeps our patients at the center of care. Through an integration of multiple treatment approaches, program philosophies and structured support, we provide comprehensive services to address the whole person, taking special consideration of interconnected nature biological, psychological, social and cultural aspects of recovery. *The clinical services currently being provided occur as a component of One Community Health’s medical care and does not qualify as specialty substance use treatment but is a facet of an integrated model of care supporting Medication Assisted Treatment (MAT) for Opiate Use Disorders. For any patient who requires extended specialty care for higher acuity, inpatient, intensive outpatient, or Dual Diagnosis Treatment, the IMAT team will closely collaborate with other community service providers including Mid-Columbia Center for Living, Wasco County Community Corrections, The Next Door, Compressive Healthcare, and others to provide our patients with individualized services to best meet their needs.